I just fell in love with this door. Baskets, sunlight, and the aroma of coffee drifted out into the London Street. The door is almost obscured by the delightful baskets, and goods for sale. Charming…just charming. 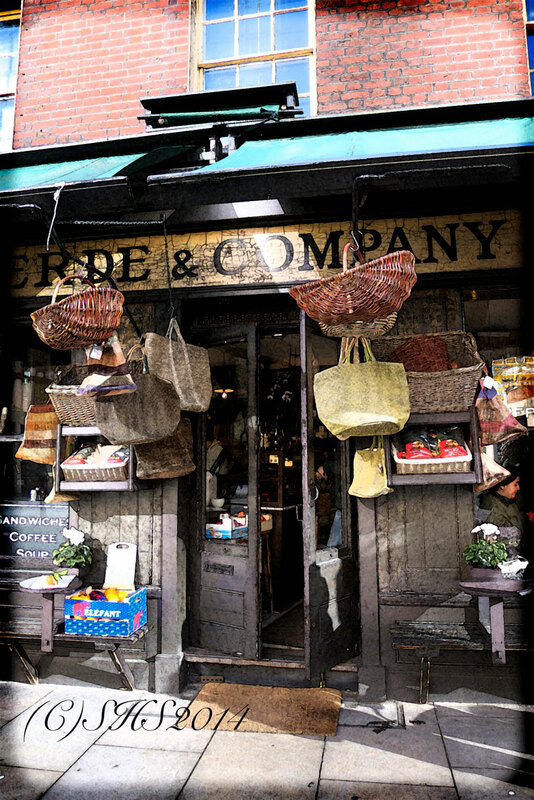 Verde & Company’s– London Door in delightful Spitalfields. Gallery | This entry was posted in Doors and tagged England, London, London travel, Spitalfields London, Spitalfields Market, Susan Sheldon Nolen's Doors, Travel Photographs, Travel photography, Verde & Company. Bookmark the permalink. This is superb Susan…shame there aren’t too many like these left. I know! It’s hard to find them, but I always wonder what they would think…oh how dreadfully old fashioned and would they gaze up at the Gerkin wistfully? 🙂 Grass greener and all that!